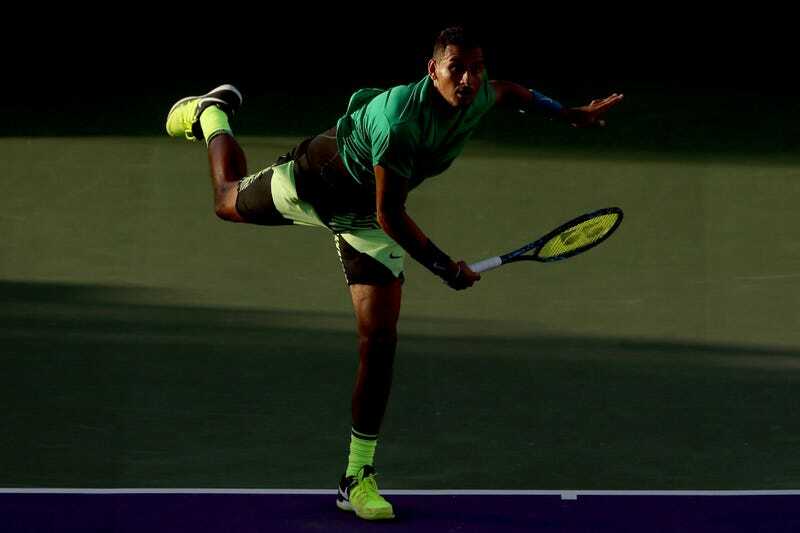 Both Nick Kyrgios and Alexander Zverev, the two most promising players aged 21 or under, survived their third-round tests yesterday against two aging serve-bots. Neither win came easy. When your competition moves around the court with the grace of a mannequin but can still regularly whoop 130 mph aces right by you, all you can reasonably hope to do is hold serve, take smart risks on return, and capitalize on the tiebreaks. But because this player archetype—honking serve, decent forehand, what’s a backhand?—will persist on the men’s tour until the end of time and tennis, the kids will reap lifelong benefits from sussing out how to beat them. Nineteen-year-old Zverev defeated American John Isner in three sets despite not finding a single break of serve all day and staring down three match points. Every single set wound down to a tense tiebreak. When the German, down 4-5 and 0-30 in the decider, finally seemed doomed, he lucked out with this gorgeous mishit that kissed the sideline. That was enough to send Isner snacking furiously on a banana in the middle of a game, which you are, uh, definitely not supposed to do, but hopefully inspires a new wave of munching-as-venting. He is also innovating in the field of post-game celebrations: the ballboy cap-reversal.